How Does the Skin Change When You Lose Weight? I just read an excellent article by Dr. Richard Tew on Carolyn’s Facial Fitness website. In the article he talks about how a quick loss of weight, perhaps with bariatric surgery, would have a negative effect on facial skin and the skin of the neck. The weight loss would make the skin sag and crease. Whereas a slow loss of weight with diet and proper exercise might keep the skin of the face and front of the neck from becoming slack. The skin would adapt to the new body weight, especially if the facial and neck muscles were exercised three or four times a week. But read the whole article I linked to above. Here are some of the topics Dr. Tew discusses: Weight Gain Is Different for Face and Neck, What Does the Skin Do When Weight Is Lost? Stretching the Skin, Skin Is Dynamic, and Use It or Lose It. It’s a long article, but for people who are now overweight and tend to lose weight, the information is valuable. But this is a good article for all people. I’ve read it several times and learned a lot from it. 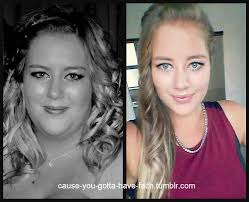 There is a dramatic positive change in this woman’s appearance. She is now an attractive woman. “Beauty is better than any recommendation letter.” Aristotle obviously thought that beauty was a great asset, one that can make a person’s life easier and open many doors. This is superficial but it is not total nonsense. An attractive face does get attention.